My first experience with roleplaying games was at Scout camp. The older Scouts, huddled around a lantern-lit picnic table one night, were enthralled by the DM’s description of a massive ogre squatting in the center of a mold-crusted dungeon corridor. The ogre had captured a band of hapless dwarves. Choosing which one to have for supper was why it hadn’t yet noticed our brave adventurers: the PCs—the older Scouts—hiding behind some barrels, unsure if they should run for their lives, or try to help the dwarves. Back in real life, player character sheets crowded the picnic table, scribbled with such arcana as “two-handed sword” and “magic staff,” as well as multi-colored—and sided!–dice, plus an artfully deployed dungeon geomorph, showing a top-down view of the dungeon. So much so, I’ve made a career out of RPGs. Way back in 1995, I landed a design job at TSR, then I transitioned to Wizards of the Coast, and now I’m at MCG. I adore lots of RPGs, don’t get me wrong. But Numenera figures prominently on that list for many reasons, including the following. Reach into the dust, and you’ll find that each particle has been worked, manufactured, or grown, and then ground back into drit—a fine, artificial soil—by the relentless power of time. Look to the horizon—is that a mountain, or part of an impossible monument to the forgotten emperor of a lost people? Feel that subtle vibration beneath your feet and know that ancient engines—vast machines the size of kingdoms—still operate in the bowels of the earth. How humans have once again come to be present in this world of tomorrow isn’t known or relevant. The fact is, they’re here, and they’re looking to survive in a shockingly strange place made up of the ruins of a succession of fallen extraterrestrial and transdimensional civilizations. 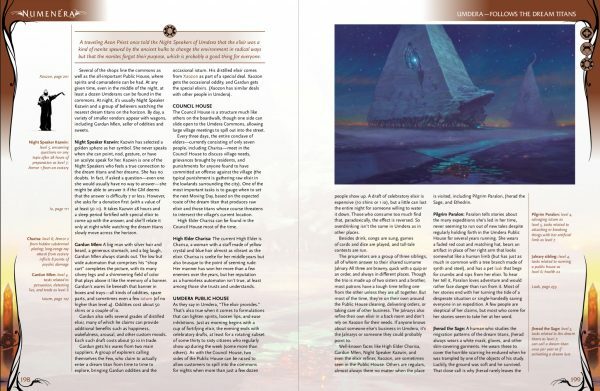 Numenera is science fantasy. So while the RPG retains all kinds of fantastic elements, those beats are derived in part from actual scientific discoveries that super-advanced civilizations might one day fashion. But of course, to humans, thrust suddenly into a world where the cliff-face across the valley might actually be the edge of some vast ruin filled with dangerous automatons, distinguishing magic from advanced technology is difficult. Though Numenera retains many familiar fantasy RPG elements, it also offers an interesting change of pace for players. Understanding everything players run into during an adventure is impossible. Why does each bubble floating up from that boiling vat speak some variation of “Where am I? Who are you? Are you my friend?” before inevitably popping? Why does the moon sometimes show a wide band stretching across it like a greenish stripe, and other times look pristine? Why do objects placed on the black pad become duplicated, though reversed like things seen through a mirror? 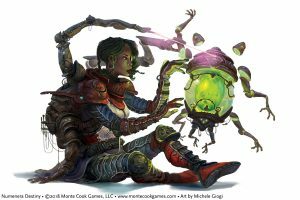 Most of the questions can never be answered; they’re just inscrutable elements PCs encounter as they make their way through the strange and amazing world of Numenera. Open up any Numenera product and you’ll see that we spend a lot of time designing and laying out our books to provide something that’s not only pleasing to the eye, but also immediately useful for reference. If a topic mentioned in the main text is touched on elsewhere in the book (or another book), we highlight that text and provide a specific page reference in the margin. These margin “callouts” might also offer additional thoughts, related content, or sometimes even visual information helpful for the GM. Take a look at a couple spreads below, and you’ll see what I mean. Note the size comparisons and other useful callouts in the margins. The Dream Titans are shambling mountains that roam lowland regions. RPGs are a bit of real-life magic, and one of those enchanting bits is character advancement. The idea that your character can improve to a new and better level of ability is just the kind of reward that motivates play above and beyond exploration and discovery. Almost every RPG you can think of, including all the computer versions that grew out of paper and pencil versions, rely on character advancement. 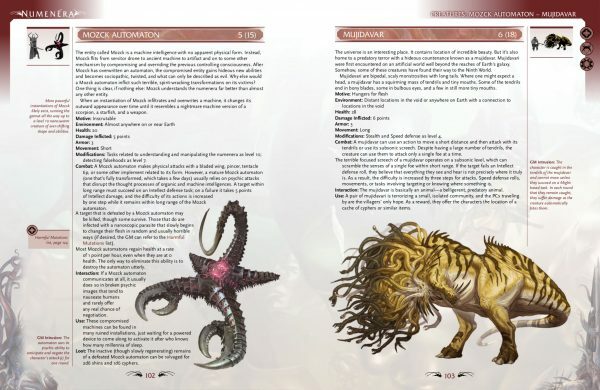 Numenera character advancement breaks traditional level advancement down into a series of increments, each of which offers its own character ability reward. Each step “costs” a few experience points to purchase, and each step can be taken in any order. The steps include gaining new stat points, abilities that leverage your capacity to use those stat points more efficiently, and training in new skills. Once all four steps are taken, the character advances to a new level (we call it a new “tier”) of ability. Each new tier achievement also unlocks a couple new abilities, which puts the character on the path to begin advancing through the next series of steps toward their next tier. The rewards of character advancement come early and often. Players are almost constantly receiving that warm glow of having achieved a new power-up, which means their characters continue to grow in strength, ability, and knowledge over the course of a campaign (even a very short campaign). One last thing I love about the game, because I can’t talk about Numenera’s strengths without talking about cyphers. Cyphers are one-use abilities that characters gain and use over the course of the game. 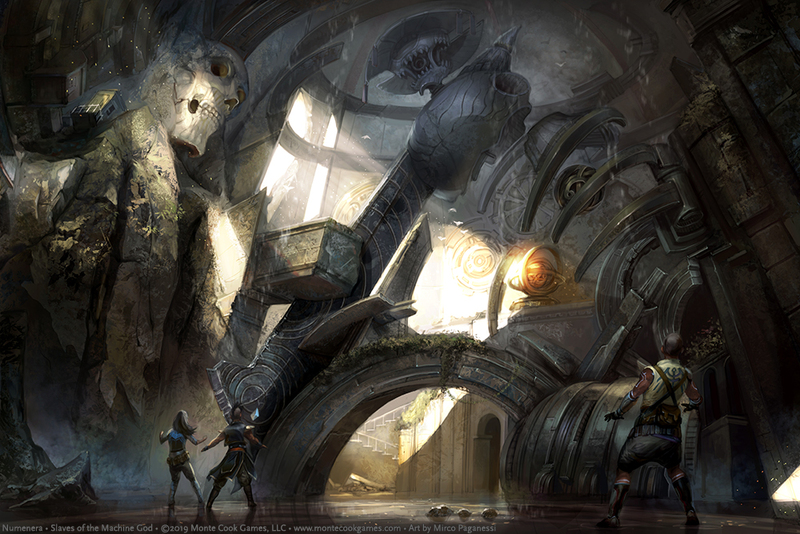 In Numenera, cyphers take the form of leftover relics of vanished civilizations so advanced that even their cast-off technology provides amazing effects. A particular cypher might let a character emit a powerful laser beam at a foe, give the character perfect recall for a day, become a small automaton that helps the character for a while, allow the character to pass through a solid object, and so on. Cyphers set Numenera apart because a character’s abilities can change from session to session, which means the unexpected is always around the corner. Cyphers are a powerful tool for keeping gameplay fresh and exciting, since by their very nature, they’re always changing. Cyphers = Excitement! All of which is to say that if you want to try out new forms of excitement, receive consistent rewards from incremental character advancement, enjoy a fresh take on presentation, and be enthralled by a world built on the ruins of several previous super-science civilizations, you might just find that your love of RPGs has room for some Numenera Discovery and Numenera Destiny, too. 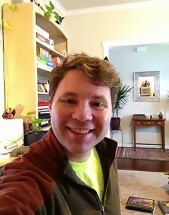 This entry was posted in Articles & News, Design Diaries, Design Lab and tagged Numenera.